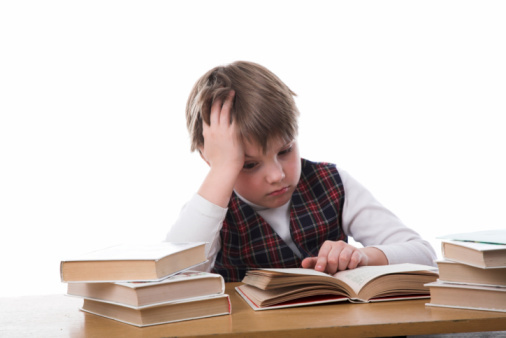 Why do poor children perform more poorly than rich ones? Research has shown that children of poorer parents display substantially worse math and reading skills by the time they start grade school. Other studies have revealed that these wide gaps in pre-school skills persist into adulthood and help explain low educational attainment and lifetime earnings. Put together, these findings paint a bleak picture of how the fates of generations of poor children are largely sealed before they even set foot in a classroom, suggesting the current K-12 school system is ineffective as a springboard for opportunity. So if we want a society that is meritocratic, we need to answer a fundamental and vexing question: why do less well-off children perform so poorly? Once we get a better sense of the answer, we can begin to understand how to improve mobility from generation to generation and craft appropriate economic and social policies to close the yawning income-related gap in ability. These income-based achievement gaps are at least partially caused by substantial differences in how much rich and poor parents invest in their children. For example, parents of very young children among the top 25% of earners are more than twice as likely to have at least ten books in the home than those from the bottom quartile. 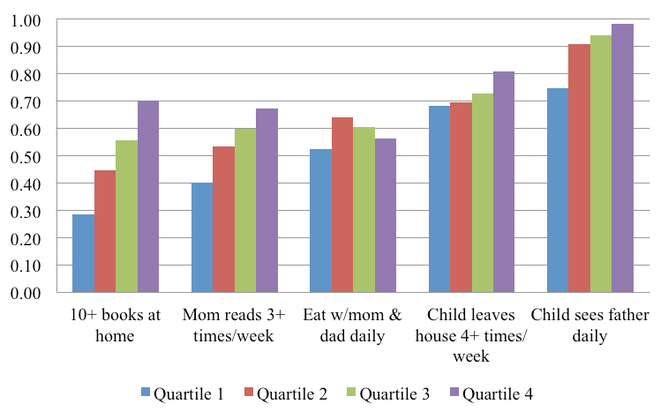 Wealthier mothers are also more than 50% more likely to read to their child three or more times a week. In addition, children aged 6 to 7 from richer families are more than twice as likely to be enrolled in special lessons or extracurricular activities compared with their lower-income counterparts. That leads us to the next question: why do rich and poor parents invest so differently in their children? One important reason parents invest so much time and money in their children’s development is to improve their career prospects when they grow up. Economic theory tells us that if this were the only reason families invested in their children (and all parents had sufficient access to borrowing), then all families would invest time and money up to the point where the labor market returns to the last dollar of investment equals what the family could earn from putting that same dollar in the bank. Put simply, they’d invest in their kids until stashing cash in a savings account offered the same return. This does not necessarily mean that all families should invest the same amount in their children, as not all children earn the same labor market return from the same investment. Indeed, children with higher ability have higher marginal returns at every level of investment. So, it takes more investment in them before the return on this additional investment equals the gains from savings. This suggests one potential reason children from higher-income families receive greater investments and perform better academically: the natural ability of children and parents may be positively correlated. Higher-ability parents will tend to earn more and have more able children leading to a positive correlation between parental income and child investments and achievement. The fact that these investment and achievement gaps shrink considerably when accounting for differences in maternal ability and education suggests that this is likely an important part of the story. However, the fact that significant gaps remain even after accounting for these characteristics suggests that other factors are also likely to be important. First, parents may care about more than their children’s future careers. Parents may simply take pleasure in reading stories to their children or watching them learn to play a new musical instrument. They might enjoy bragging to their friends about their children’s success in school. In other words, if investments in children provide a direct benefit above and beyond the future labor market returns, parents will choose to invest more as their income rises – just as they tend to purchase more of other goods or services as their earnings increase. Another explanation for the difference is that low-income parents may be poorly informed about the value of investment activities. They may face uncertainty about (or under-estimate) the value of investing in their children. A third possibility is that poor parents may be unable to finance desired investments if they cannot borrow fully against their own future income or against the potentially high returns earned by their children. While all of these possibilities might explain why richer parents invest more in their children than their poorer peers, it is important to understand which ones actually do, because they have very different policy implications. If parents are investing in their children up until the return is the same as saving elsewhere, then there is no way to shift spending to increase future income, and the investment level is efficient. On the other hand, if they are investing too little in their children, so that the labor market returns are higher than saving elsewhere, the investment level is inefficient. In this case, policies that shift spending to education investment for these children increase future income. 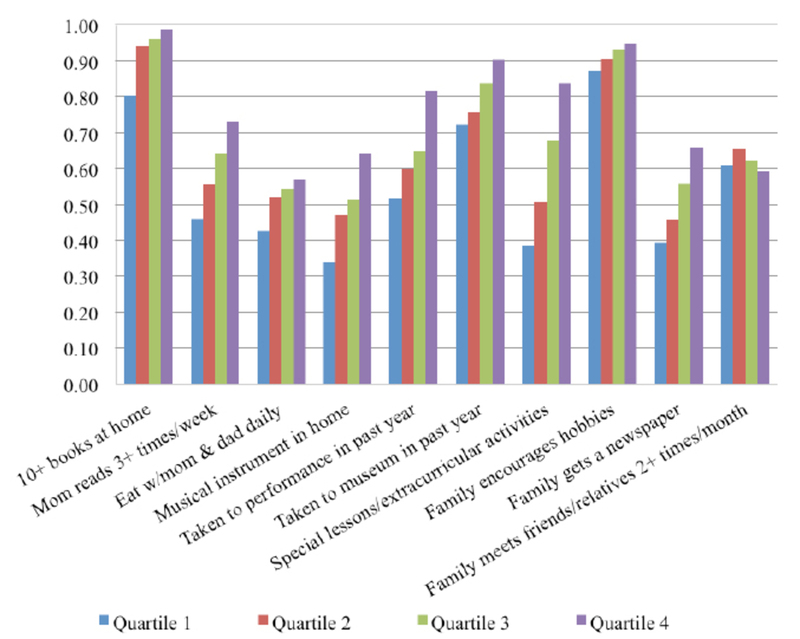 If investment gaps result only from a strong correlation between the abilities of parents and children and/or the pure pleasure gained from activities like reading to a child, policies designed to reduce the income-related gap may be equitable but inefficient (that is, they may reduce overall US output). By contrast, if low-income families are poorly informed or constrained in their capacity to borrow, then they may make inefficiently low investments in their children. In this case, well-designed policies can improve both equity and efficiency. fact 4: income received when a child is young has a greater impact on achievement and educational attainment than income received when the child is older. Our research showed that to explain the high returns to additional investment among the poor (fact 1), information or credit market failures are needed. Absent these market frictions, families will invest until the returns are driven down to or below the returns on savings. The timing of income is only important (fact 4) if some parents are constrained in their borrowing. Otherwise, families can always use borrowing and saving to spend money when they want regardless of when it is received. If parents with young children are poorly informed about the value of investments and/or face limited borrowing opportunities, then policies designed to alleviate these market failures can improve efficiency while also improving the economic outcomes for those who are most disadvantaged. What might these policies look like? Governments can step in to directly provide credit for early child investments like they do for college students. One recent example is New York City’s pilot program, Middle Class Child Care Loan Initiative, which provides low interest loans to middle-income families with small children to help pay for quality childcare programs. Means-tested subsidies for preschool can also help address borrowing problems. Programs that help inform low-income parents about the value of talking and reading to their young children or the benefits of attending a quality preschool are steps towards confronting information problems. By ensuring poorer families have access to financial resources and information about how important it is to make even modest and inexpensive investments in their children like a bedtime story, we can go a long way to shrinking this investment gap.